2. Heat about 2 cups water to a boil in a small saucepan. (Be sure it's small enough that the bowl, when set on top, will not fall in. 3. Once the water is boiling, place the bowl on top of the pan. 4. Stir almost constantly until all the chunks of beeswax are melted, and the mixture is well combined. 7. Let cool and then seal the containers. Let me know what you think. I just tried some of mine and it's quite yummy. I will put some sunscreen in it next time too. Love this song and can't seem to get it out of my head. I posted it on my facebook yesterday, and my oldest niece thinks that Jewel looks like me. So isn't that just about the best compliment ever? I sure think so! :) What a sweetie! Alright, day 1 went well. I ate more well-balanced with more veggies and still felt satisfied. I also lowered my overall calorie intake and lost a pound. (Well, according to the scale...but who knows...maybe I will gain it back within the next sip of coffee. ) So, I think we're off to a good start. Just in time for Memorial Day picnics and BBQs! Here's a salad that everyone can enjoy and you can tailor to make sure everyone will. :) You can serve this as a main dish or side dish. Enjoy. . .
2. Drain and rinse pasta, then place in a bowl. 3. Mix in tuna, veggies, garlic, olive oil and sour cream. 4. Cover and store in the fridge until ready to serve. So, I've set a goal to not only eat healthier but be healthier. So, I would like to lose 15 pounds by the end of summer. Or otherwise until my sister-in-law's wedding. :) So, not only do I want to lose the weight, but I want to do it in a healthy way. So it will stay off and I will be healthier overall. So, yeah....I also put a ticker so you all can keep me accountable for the weight loss too. It's on the left sidebar. :) I will try to update it every day or two. So it stays up-to-date! Ok, just found a pretty sweet site that has a daily food/exercise log online and it's all free. So here's the link. PS I am going to probably need some support though. So, feel free to give invisible high-fives and send prayers my way too! :) Thanks! So, I love pizza, my hubby loves pizza and I'm pretty sure everyone--at least in America--loves pizza! :) So here's another twist on it right. Well, we've all probably tried making pizza rolls at home at one time or another. I know I have before last night. But they never turned out like I wanted them to. Last night they did turn out well, but still not quite what I was going for. Ok, have you ever heard of Pizza Street? Well, they used to make the BEST, seriously the best pizza rolls ever. The only sad thing is that the last one in Northern Colorado just went out of business. :( Huge sad face. My family and I had eaten those pizza rolls for years and always enjoyed them. But now, we can no longer have their fantastic cuisine. :( I wish I would have known when exaclty they were calling it quits though, because I would have tried to see if they'd give me the recipe. Their dough was out of this world, thin and slightly greasey....but perfect. 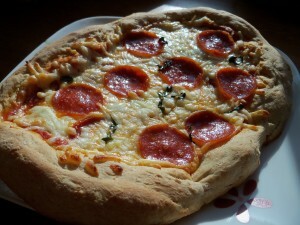 Then the filling was mostly pepperoni, but just perfectly baked with a great dipping sauce. 1. Combine water and yeast in medium-sized bowl. 2. Add salt, sugar/honey and oil to the yeast water. 3. Gradually add in the flour, making sure that you are thoroughly mixing it. 5. Divide into 3 sections (or more for smaller pizza rolls). 6. Roll out sections of dough into ovals/rectangles. 9. Bake in a 350 degree oven for about 15 minutes, or until golden brown. 1. In a medium-sized bowl use a hand mixer to fluff up the egg whites. Set it to high and run it until it is white and peaks form. 3. Let chocolate cool some and gradually add the egg yolks into it. 4. Mix the sugar into the chocolate mixture. 5. Now, carefully fold the chocolate mixture into the egg whites. Combine gently, but thoroughly. 7. Bake in a preheated 350 degree oven for 15-20 minutes. Mine took about 20 to cook. 1. In a medium sized bowl use a hand mixer to fluff up the egg white. Set it to high and run it until it is white and peaks form. 3. Let chocolate cool some and gradually add the egg yolk into it. 5. Now, carefully fold the chocolate mixture ino the egg white. Combine gently, but thoroughly. 7. Bake in a preheated 350 degree oven for 15-20 minutes. Mine took about 17 to cook. 1. In large bowl dissolve yeast in the warm water and warm milk. 2. Add honey, salt and dash of oil. Stir. 3. Stir in wholw wheat flour. 4. Mix in all purpose flour. 5. Start kneading dough and instead of on floured surface, use oats on the surface. (Quick Oats.) Knead until the 1 c. of oats are combined. 6. Let rise in warm place for about 30 minutes. 7. Punch down and place into the desired pan for baking. 8. Let rise again for about 30 minutes. 1. Pre-heat oven to about 450 degrees. 2. Whisk eggs, flour, sugar, milk, salt and baking powder together in a medium bowl. 3. Melt butter in a 10 inch skillet on the stove top. Cover pan in the melted butter. I cut it into slices before serving. 1. In small saucepan combine berries, water and sugar. 2. Heat to boil, stirring occasionally. 3. Boil for about 5 minutes, stirring more frequently. 4. Cool in the refrigerator until the german pancake is done. 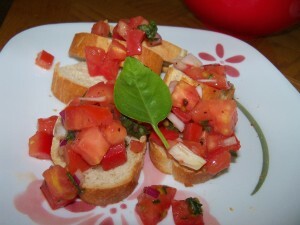 If you love bruschetta, then you should try making it at home. Super easy, delicious and healthy! :) Gotta love when those three are in the same sentence right? Now the bruschetta is actually all up to you, and your preferences. So if you really like basil put a ton in. If you really like onion add lots of that. Or if you like a nice balance dice up the tomatoes and add small amounts of the other things until it tastes "right" to you! I used my pizza recipe, but made a few changes. 4. Punch down and divide into how ever many pizzas you'd like. 5. Spray a baking sheet with cooking spray. 6. Take one section of the dough and flatten into the shape you'd like. I did rectangles for a more authentic brick oven look. 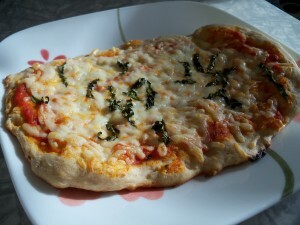 Think about whether you would like a thin crust or a thicker crust when flattening them out. I made mine a thin crust and my hubby's thick crusted. 7. Repeat step 6 with the rest of the dough. You may need more sheets than one. 8. Add sauce, cheese and other toppings to your creations. 10. Enjoy! Oh and be careful it's really hot! If you listen to country music you have probably heard this song on the radio by now. It's awesome, catchy and the singers are good! :) So that's altogether things I just love in a song! It turns out there are three members in the band " The Band Perry" and they are siblings. Cute huh? Makes me reminisce of the times I dreamed of starting up a band with my sisters. 1. Choose desired cup you'd like to drink your frappe out of. 3. Measure out the ingredients. So if it's a 12 ounce cup, do 4 oz coffee, about 4 oz ice cream and 4 oz milk. 4. Pour those ingredients into the blender. 5. Then fill the cup up with ice and pour that into the blender as well. 1. Put Pie crust into pie plate/casserole dish. 2. Whisk eggs together in large mixing bowl. 3. Add Milk, Cottage Cheese and Gruyere and blend together. 4. Add Salt and Spinach to egg mixture. 5. Put sauted garlic directly into the pie shell. Spreading evenly on the bottom. 6. Pour Egg mixture into the pie shell and smooth out the top. 7. Bake in a 350degree oven for about 45 minutes. 1. In large bowl dissolve yeast and 2 T. sugar in 1 c. of warm water. 2. Stir in sugar, butter, eggs, lemon extract and milk to yeast mixture. 3. Add flour until a soft and sticky dough ball forms. 4. Knead for about 5 minute incorporating more flour, so it is workable and not sticky. 5. Grease bowl and let rise in a warm place for 45 minutes. 6. While dough is rising mix together ingredients for the poppy seed paste in a separate bowl. Set aside. 7. After the dough has risen for 45 minutes, punch it down and lay it out on a floured surface. 8. Divide the dough in half and put half back in the bowl. 9. Roll out half of the dough into a somewhat rectangular shape. Try not to roll it too thin though. 10. Spread half the room temperature poppy seed paste over the rolled out dough. 11. Carefully start rolling the dough up like a cinnamon roll. Be gentle because the dough is very soft, which will make it so delicious! It's easy to tear though. 12. Finish rolling up the roll and pinch the seam closed. 13. Transfer to baking sheet and eggs wash.
14. Bake in a 350 degree oven for 25-30 minutes. 15. It should look something like this when it comes out! Serve and enjoy! Oh, and do the same with the other half of the dough! :) Wait until it is completely cooled to wrap it up. This is great any time of year, but especially great for the holidays! So, my husband walks in the Graduation Ceremony tomorrow. He will then defend his Dissertation in Mid-July. So, he won't really be done till then, but since tomorrow is the day he actually walks and wears all his regalia, it's still a big day. At least I think so! :) So I wanted to make him something, but not have to spend too much time on it like a fancy cake. So I decided to make a cookie pizza and decorate that! Here's how I decorated it. :) It made a scroll, then wrote his class year in it. Then I did the shells around the cookie. Then I decided it needed a little bit more, so I made flowers. Since I don't know how to do roses yet, I made some that look like one of my hubby's favorite flowers. Azaleas. Do you love homemade ice cream as much as I do? Can you just not wait till summer to make lots of it? That's how I was...so for the last week or two I have been making some ice cream every few nights. I can't really share the whole recipe because it's a family secret. But, I can tell you that I use skim milk in it, and it still comes out super creamy and delicious! Anyway, I usually am a purest with most things I like. As in, I like the original form and usually don't deviate. For instance I never eat fruity ice cream, or really much more than just chocolate or vanilla. Sounds boring right? But that's just the way I am. Not boring...just stuck in my ways. If I like something, why mess with perfection? When I say "I'm a Christian", I'm not saying "I am perfect". I'm confessing that I can stumble and I rely on God to guide me. When I say "I'm a Christian", I'm not saying I have it all together. I once was lost, but now I'm found and forgiven. because who am I without Christ in my life? but showing how weak I am. But with Christ anything is possible. I'm admitting I failed, and cannot pay the debt for myself. bad things happen, but I run to Christ instead of cursing His name. When I say that "I'm a Christian", I'm not saying I'm better than you. I'm a sinner too, but I've received the grace of God and you can too! So, all in all, it's been great today! I always feel so accomplished when I can cross that many things off my to-do lists. Don't you? Maybe you don't make to-do lists. I have to! I have occupational add, or that's what I call it...since I have so many jobs (Substitute Teacher, writer, photographer, blogger, etc....) it's hard for me to keep track of things as it is, even with a list, so what on earth would I do without one? The retro fabric I used! Ok, update on the curtain rod deal. It turns out I was doing just fine. I did it all right, except I hit some metal in the wall, that it wouldn't go through. So my hubby moved the placement a bit and got them in just fine. :) My kitchen is now also homey! Love it! I just got to thinking that I should probably make a post about which honey I use. I add it to a lot of recipes and it's local, so I will give them some credit too. You know how eating local honey (I think they recommend 1 t. a day) can help with allergies. Well, I've been trying that for a while now. It does for the most part seem to be helping too. Plus, I get to help support a local bee keeper and their yummy honey! Did you know that there are actually a lot of different varieties of honey? To me it's a lot like beer. Not in taste of course, but with the variety. The lighter ones are less pungent and the darker ones are richer in flavor--more robust you could say. Then some of theirs are pollenated differently and from different types of sources. Check out their site for more info. 2. Combine the Yeast and water/milk in a large bowl. 3. Add honey, oil and salt, then stir together. 6. Let dough rest and rise in warm place for about 20 minutes. 7. Punch down and shape into loaf. Put on baking sheet or in loaf pan. 8. Let rise for another 10 or so minutes in warm place. Something that seals to shake it in. 1. Put desired amount of ripened heavy whipping cream into sealable container. 3. Add salt or honey if desired. 4. Mold into desired shape and refrigerate. 1. Measure out 8 ounces of the ripened heavy whipping cream. 2. Put in the sealable container. 3. Seal it and start shaking. 4. After just a couple minutes it will feel like "whipped cream" so it’s on it’s way to being butter. 5. After 1-2 more minutes it will start getting chunky. Keep going. 6. After 6 minutes it will start to look like whipped butter. Keep going. 7. After a few more minutes it will definitely become butter. Keep shaking until you know it is butter. It will clump up nicely and feel much different when you shake it. 8. Drain off the "buttermilk" using a spatula, like shown. I poured it into a measuring cup so I could see how much there was. You don’t have to. 9. To get more of the liquid out, put the butter into the mesh strainer gently. If you are too rough it will come out the bottom. 10. Stir around slightly in the strainer and some more liquid will come out. 11. If you want unsalted butter, then just shape and refrigerate. If you want salted or honey butter continue on. 11. Wipe out bowl and place the butter in it. 13. Mix together with a little whisk for best results. 14. Shape into desired shape and refrigerate. 16 ounces of Whipping Cream yields 2 sticks of butter and about 1 c. of that "buttermilk" or basically skim milk. Note: Save the "buttermilk" if you’d like. It’s not like the buttermilk you would buy at the store, but it is basically fat free milk that can be used as such in recipes. See my white bread recipe that I used it in after I made this butter. Anyway, I just bought some cute new dress pants from Kohl's last week and got to wear them for the first time today. Ok, let me back up a minute. I am 5'3.5" tall. Ok, to be honest. I round to 5'4" tall. So I am a petite size. But I still have the hardest time finding pants that are short enough. Strange I know, because I every other person besides me in my family has the opposite problem. You know, they can't find ones that are long enough. Well, take the extra length off mine! Just kidding...if only that could work... Ok, back to the new pants. So I tried them on at Kohl's and they fit great, even the length seemed to be fine. They even came with a super cute little belt. I bought them and they were on sale. Although, I am pretty convinced there is never a time where you have to buy things at regular price at Kohl's. Ok, sorry, I know I get distracted with details. . . I put my pants on this morning and put on my shoes and they are WAY too long. Like if I had left with those shoes on my pants would have holes in them after today. So, I just grabbed a pair of heels to wear with them instead. Although these heels are some I always, only wear with dresses and hose. So when I tried to wear them with socks it didn't work. So, since I didn't have time to dig and try to find knee highs I just wore them without socks. Mistake #1. No socks. Ok, so I was working today at an Elementary school. I had to stand and walk around all day, which isn't out of the ordinary as a sub (or teacher for that matter). But when you have heels on, you notice every minute you are on my feet and so do your feet. So, when I finally thought I may have a chance to sit for a while I realized I had outside after school duty. No prob right? Well....except for the fact that I had these heels on with no socks and had to walk 2 blocks to the crosswalk I needed to help kiddos across with my little stop sign. Yep. So I had to walk down there and when I came to a limping stop I decided to look at the damage. You guessed it. A HUGE bloody mess all over my foot. Next to the achilles tendon and near the top of where the shoe hits. Ouchy Wawa. I about died when I saw the blood...but there wasn't anything I could do about it then. So I helped the kids across the street and prayed it would quit hurting. I managed to make my way back to the building safely...but my feet were just killing me. Mistake #2. Walking WAY too far in heels with no socks. Mistake #3. Not having back up shoes in my car. Mistake #4. Not having bandaids/ointment in my car either.